Does that word grab you? What do you think of when you hear it? Do you associate any person, business or organization with it? Rebranding is never easy. Even the best organizations can flop at it. Remember Gap’s failed attempt? Now, Wharton, one of the best and smartest institutes in the world, is struggling too. Not sure they recognize that yet though. Makes sense, right? Their reason for rebranding is a good one. The new marketing materials rely heavily on charts and graphs, including an infographic with concentric circles to show how far students travel to study at the school and another with colorful vertical bars to represent finance professors’ years of experience. Smart. So far, so good. So what went wrong? Clearly, they want to woo potential students with knowledge. But, they forgot the most important part—the differentiator. Why a Wharton undergraduate degree? Why should a 17-year-old want to study at Wharton rather than be a math or economics major at Penn or elsewhere? Answer: You could get an undergraduate degree at Harvard, Yale [or] Princeton. A lot of these students would then compete with our students for jobs on Wall Street or with consulting firms. At Wharton, it’s half liberal arts and half business, and we think that’s a pretty good mix. Lame. I expected to hear a strong differentiator there. Instead, we got a half-assed hint of “half liberal arts and half business.” And if the school overall thinks that, why did they just decide on “knowledge”? Wharton is a top-three business school known for its strong finance programs. Living outside of Philadelphia most of my life, I can tell you that you have to be smart to go to Wharton. The best and the brightest want to go there, and the school has strong entrepreneurial ties. 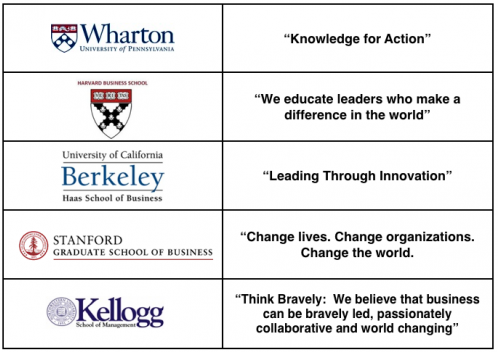 What would make you choose Wharton over Harvard, Yale, Stanford, Princeton, and Columbia? See, I thought Wharton’s single word would be “Wharton.” Why? Because it’s Wharton. What other word or brand do they need? It’s kind of like Harvard or Yale. There’s no need for a tagline. Doesn’t every school impart knowledge? Innovation, social impact and being global are important current focal points for schools and for businesses. These are factors Gen Y look for. Where are these in the new brand? The economy has sucked for the past 10 years or so. Take students with exceptional minds and add Wharton’s strength in finance and global reach and the result is leaders who can make a strong global, social impact and solve these economic problems. You want to change the world? Wharton can give you the tools. Who wants pithy little knowledge when they can have gravitas? Wharton. Shaping leaders who change the world. Wharton. Your first step toward leaving a legacy. Wharton. Giving you the power to change the world. Wharton. Transform the future of business worldwide. Innovators, difference-makers—Your home is here. Did you feel that dip? That blah at the end? Check out Wharton’s new video. There are plenty of directions they could’ve gone using the words and ideas in this video, yet they still chose knowledge. Knowledge only gets you so far. It’s the application of it that breeds success, and that comes from wisdom. Don’t believe me? Wharton gained plenty of knowledge from all the data they collected from their crowdsourcing efforts—really good data. But they chose Knowledge. Wharton. Wisdom is your window to the world. Get students excited about being there. Yes, use the charts and infographics, but also keep the testimonials. Get good ones. Why not get alumni, especially famous and successful ones to say why they chose Wharton over Harvard and the like. Get alumni to share powerful stories of how they’re making a difference now. Do it in the format of Fast Company’s 30-Second MBA videos. That’s smart! And I’m not just saying that because these are my ideas. C’mon Wharton, your knowledge tagline just makes you sound like the 131-year-old you are. And you’re welcome for the free advice. Feel free to contact me if you want more. By the way, Wharton, if you don’t want to listen, maybe one of the other schools will. Kellogg’s message is so long you can’t call it a tagline and has “we believe” in it—a major mistake. I’m sure they’d be happy to change to: Kellogg. Because wisdom takes you further than knowledge. For an in-depth story of how Wharton went through this 3-year rebranding effort, check out Poets and Quants’ Wharton Crowdsources Its Branding Message. It’s not enough anymore for brands to “just” have a TV commercial. Video can be spread much farther, so the goal is often for a brand’s commercial video to go viral. What started me thinking about this lately was the Absolut Greyhound ad. It has this very cool, futuristic vibe to it, but it didn’t seem to really push the product. I’m not a fan of this video as an advertisement, though it does make a decent music video for the Swedish House Mafia. And you’ll see there’s even a call to action in the bottom left corner of the ad to “Shazam now” and, I guess, find the music and/or video on the mobile music site. Maybe Absolut wanted it to seem like product placement in the video instead of an advertisement. The problem is, will you really make the association between futuristic greyhounds and Absolut vodka? I doubt it. But their previous ad, I think, did things a bit better. This is a fantastic idea—a way to get more people interested and involved. I don’t know so much about using Absolut as a catalyst for a “global creative movement,” but they do get an international audience as evidenced by the comments on YouTube being in various languages. My personal favorite comment is one that contradicts the ad’s closing statement, “It all starts with an Absolut Blank.” The commenter’s idea was (I’m paraphrasing): Doesn’t the night usually end as an absolute blank if you’ve been drinking? I love that the artists get credit for their work. However, these videos, both Greyhound and Blank are far from viral. Notice it’s the music video that gets the most views. What does that say about the intent here? If you’re a consumer of Absolut, which I am, you will know that they named their vodkas for flavors: Absolut Citron, Absolut Mandrin, Absolut Kurant, etc. So where do “Blank” and “Greyhound” come from? 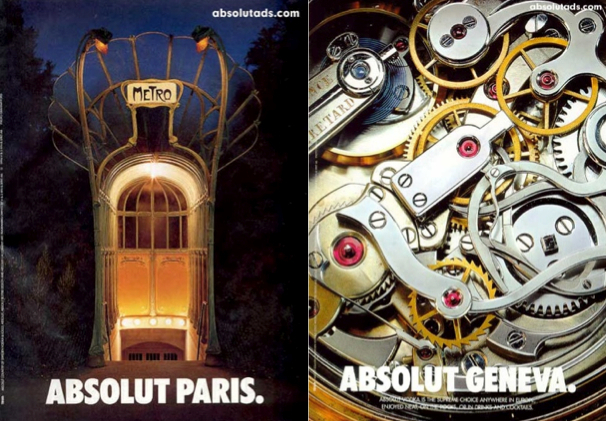 Absolut was always known for their iconic print ads, which featured the outline of a vodka bottle seen “naturally” in different locations or items (like the Paris Metro and this watch below). They had to do something different to compete in today’s world, and they had to stay in brand too. I think their new ads do stay in brand but need some tweaking to get the Absolut brand back to iconic status. I’m not confident they’ll be able to do that. Are you? What’s the hottest commercial out right now? You might argue with me, but I say it’s the advertisement for Microsoft’s Internet Explorer 9 (IE9). What makes this ad so great? First, the music. Alex Clare’s “Too Close” is an excellent choice! I was walking out of the room when I heard this commercial come on, and I stepped back in to see what it was for. That was all due to the power and excitement of the music. The music is loud, bold and soulful and completely sets the tone. It was the emotional intensity of Clare’s song coupled with the depth and richness of sound that made film director Keith Rivers feel that “Too Close” was the perfect complement to the visuals and message of the Internet Explorer TV spot, which was to focus on making an emotional connection. Keith Rivers is more filmmaker than advertiser, which works tremendously well here. At 29 years old, he has quite an impressive, award-winning portfolio. And the Microsoft IE9 commercial leaves no wonder why. Rivers started out directing extreme ski films, and I kind of feel that it’s that extreme sports mentality that boosts the impact of this commercial. What makes Alex Clare’s song so complementary to the advertisement is that it’s filled with uplifting energy and vocals that speak to what Internet Explorer stands for, a humble force powering your Web experience. The song carries you through a journey and re-energizes you, and Internet Explorer is all about that, giving the power to the user to focus on what you care about. The remaking of the Windows browser into IE9 started with a visionary idea—“to unleash a more beautiful web.” When you read the Windows blog, you can sense their excitement around this idea. And, in case you’ve never experienced this, when your whole team is excited about and unified by an idea, you usually create a terrific product. But, it’s not really about the product itself. It’s about what the product can allow you to do or make it easier for you to do. Ahh…honesty. Browsers are boring, but if they’re designed correctly, this boring web browser opens the door for you to experience the beauty of the web. The ultimate question—does IE9 unleash the beauty of the web? I guess that remains to be seen. But I know for sure that this commercial sure does. 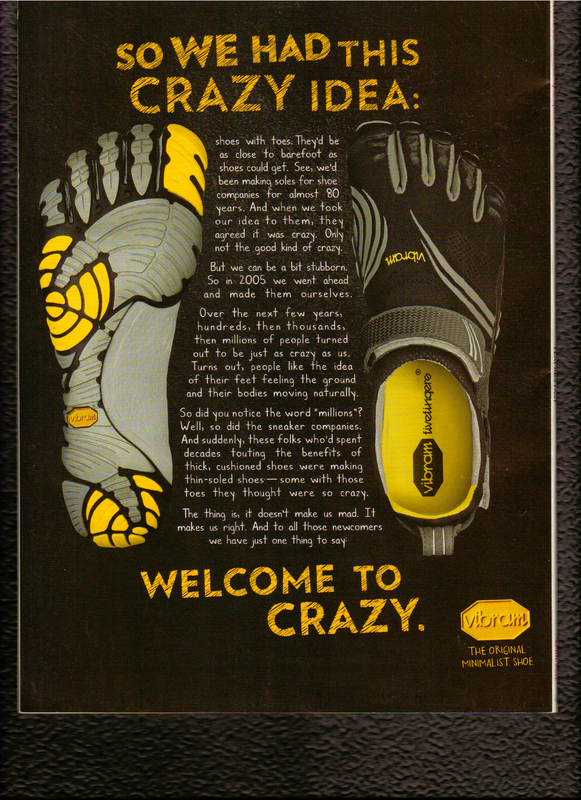 Vibram & Their Crazy Idea: Now That’s Good Advertising! I’m a sucker for a good story, and Vibram has a great one—right on the back of my Fitness magazine. Personalization and storytelling in advertising are hot topics these days. Many companies struggle with how to be more relatable and step out of their giant corporate box. Not Vibram. Not only is their story good advertising, but it’s a great example of what to do when people won’t listen to your “crazy” idea. It’s also a lesson to all those companies who said no. Vibram had been making soles for 80 years—that’s a lot of experience to just disregard. But they had faith in their own idea, and now look—almost every sneaker manufacturer out there has some form of minimalist shoe on the market. Sometimes it pays to be crazy…and to tell your audience all about it.